I was wondering the other day if I’d lost it. ‘It’ being my ability to spot something that I liked. Most especially at vintage fairs, car boot sales and antique markets. It had been ages since I’d bought anything. I blamed the weather, I blamed the people selling things, I blamed the fact that I already have far too much stuff in my house and that was squashing my desire to buy. I was still finding clothes when I went shopping. And shoes. And bags and make up etc. But just not getting that hit when I went a hunting. Many a Tuesday I have spent with my sister traipsing round Kempton Antique market in the freezing cold or boiling hot perusing the taxidermy, the old wine crates, the shop front letters, the school science equipment (remember those clamp stands that used to hold the test tubes over the Bunsen burners? [remember Bunsen burners!] Well there are whole heaps of them available to buy). My flat is laden down with odd little nicknacks and I eat my dinner off plates celebrating various coronations. There are so many pictures on my walls that it’s a strictly one in one out policy – I imagine the art cowering every time I leave for a car boot on a Sunday. It was safe to say I was having a vintage dry spell. I was picking things up from tables out of desperation. Holding them up to whoever I was with only to see their faces crinkle with disgust. I bought a few things but they pretty much went straight into the cupboard under the stairs – a resting place for guilty car boot purchases before I can justifiably take them to the charity shop. One week. A day or two of sun. Quite a lot of rain. Nice oysters. Horrid gales. No wifi. Teething one-ish year old. And quite possibly the best car boot sale I have ever been to. It was the last day. We were taking a leisurely drive to Rouen where we were staying the night before heading to the ferry. All week we had seen signs for a brocante (french antique fair) in the nearby town. So many signs that we were pretty sure it was going to be a super dooper affair and had planned a number of hours into the itinerary in order to do it justice. There were eight stalls. One of which was selling new crystal glasses. The one-ish year old was very bored. We were disappointed. We walked round forlornly. It started to rain. We bought a picture of a lobster (not found by me). And we left (working out which picture at home would be banished to the cupboard in favour of the crustacean). It was as we were lamenting the tininess of our day’s activity and the amazing marketing for such a weeny event, that we saw more signs. They were less impressive, almost missable, tied to the odd lamppost here and there. They advertised a vide-grenier (french for car boot sale/ empty attic sale – I think). We definitely had the time, but did we have the inclination? 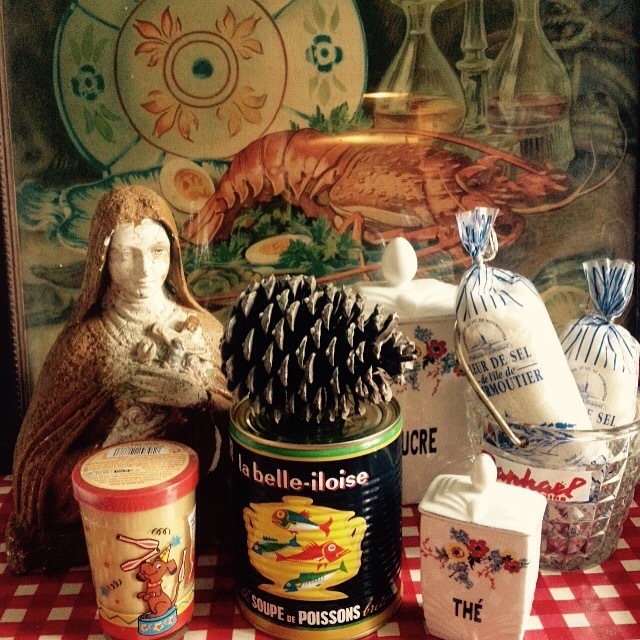 We’d been burned by the brocante. Was it worth it? There was nothing else to do. So we snaked round houses, through parks, looped down cul-de-sacs until we finally found the football stadium which housed the vaguely signposted v-g. We followed the crowds. The poor one-ish year old could sense what was coming. There it was. One whole field of stall upon stall of stuff. My french isn’t great. But it’s good enough to haggle. And I was back in the game. Now I know that what I buy isn’t to everyone’s taste, but I love it. And I loved this place. There were little ceramic jars for tea, sugar and spices, there was an old ice bucket branded for french liqueur, there was a small statue of St Teresa with only one eye that I bought for a euro from a woman who I think was a nun (it’s equally possible I made her a nun in my imagination), and for the one-ish year old there was a plastic crocodile and a plastic house thing. It was magic. And what made it even better was at the end, unlike a British car boot, there was a big open tent selling little glasses of white wine, barbecued sausages in fresh baguettes and crepes with lemon or nutella, all for a euro or two. It was brilliant. I could go home happy. I even found a space on the wall for the lobster so no pictures were banished or hurt in the telling of this tale.